CRUNCH: Featuring Bruce's first days on the job, Catwoman and a James Gordon you'll never look the same way at again, my money for best bat-blockbuster lands squarely on Batman: Year One. Now, Comics Continuum reports they have learned Batman: Year One is set to become one of DC's next animated movies. While Warner Bros. haven't confirmed its existence, it would be the perfect partner for the previously announced Green Arrow back-up feature. Jump. CRUNCH: On a similar note; it's a fact: I'm one of those old-school comic fans who believes there's no better Batgirl then the original - Barbara Gordon. Babs put the fun back into Gotham, and now thanks to Batgirl to Oracle: The Barbara Gordon Podcast, you can sign the official petition to get the shelved Batgirl: Year One animated DVD back on the drawing board. Just click the jump. CRUNCH: Earlier this week the sparkly logo for the upcoming Green Lantern movie was unveiled (see sidebar), primarily in Global License magazine - the bible for global marketing opportunities. While the article pushed the need to get in on the merchandising potential of a man whose 'power ring' can create any shape, the full-page ad pushing DC characters in general was a bit of a suprise, in terms of characters that were standing at the front of the pack. Weather Wizard but no Robin? "A Universe of Opportunities" . . . beyond just the same old Superman and Batman opportunities! Some interesting choices to push up front there. Superman, Batman, Green Lantern, sure. Those all make sense. 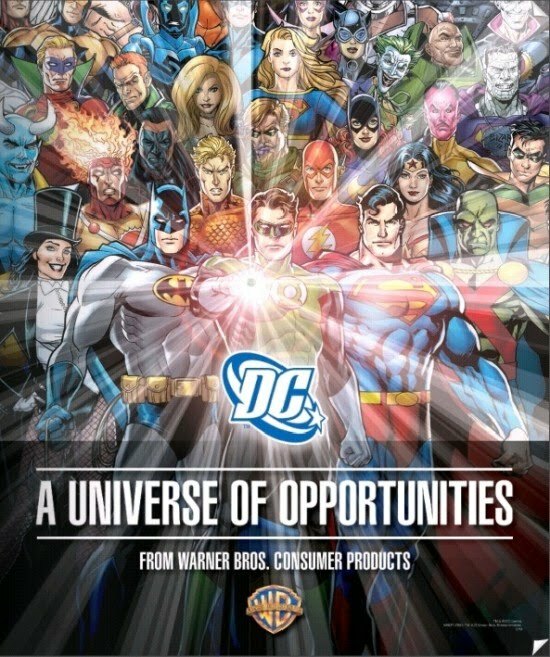 But Zatanna and Martian Manhunter in the front row? Blue Devil gets a prominent spot, which is just weird. So does Firestorm, which is cool. As a bald man, I have to ask, what's the deal with Canary's hair?!? I guess the moral is fishnets can get you anywhere Doug - I to was surprised to see Zatanna so far forward! I also feel bad for the bad dudes - sure Sinestro, Bizzaro, Lex and Joker are great but if you were going to grab a flash rouge wouldn't you want to run with Gorilla Grodd? Everyone loves a member of the monkey family!